Welcome to the Elle & Company Resource page, a curated list of my most highly recommended apps and tools for starting and scaling your online business. Not only have I tested every resource listed below, but I use each one to keep Elle & Company running efficiently. In all transparency, I do receive compensation for mentioning some of these resources. Any commission I earn comes at no additional cost to you. But I never recommend tools that I don’t use, love, and believe to be extremely beneficial for starting and scaling an online business. If you’ve been in business longer than 5 minutes, you know design needs have a tendency to pop up everywhere. You need a logo, a website, promo materials, business cards, blog graphics, pricing guides, packaging materials... and that’s just the tip of the iceberg. But how do you create them? Adobe Illustrator is my go-to tool for creating every single graphic for both my design clients and for Elle & Company. It’s easy to use and allows you to create a wide range of custom, one-of-a-kind graphics for both print and web. The best part of using Adobe Illustrator? You’ll no longer be in a bind when a design need inevitably pops up. What’s multifaceted, time-sensitive, and continually adds tasks to your never-ending to-do list? A creative small business. Everywhere you turn there’s a project to finish, an email to reply to, a blog post to write. You have to wear multiple hats while keeping a million plates spinning. It’s like a circus act. But you know that already. You also know that if you don’t have a system for keeping up with all those tasks and hats and plates, things can quickly get out of hand. It’s impossible to run your business efficiently and stay on top of all those tasks without a great project management system. Enter my favorite (free) project management tool: Asana. Business owners are becoming increasingly aware of how vital an email list is for engaging their audience and making sales. But setting up opt-ins and managing an email list can be complicated. So it’s important to use a well-designed, user-friendly platform for building your list and keeping up with your subscribers. 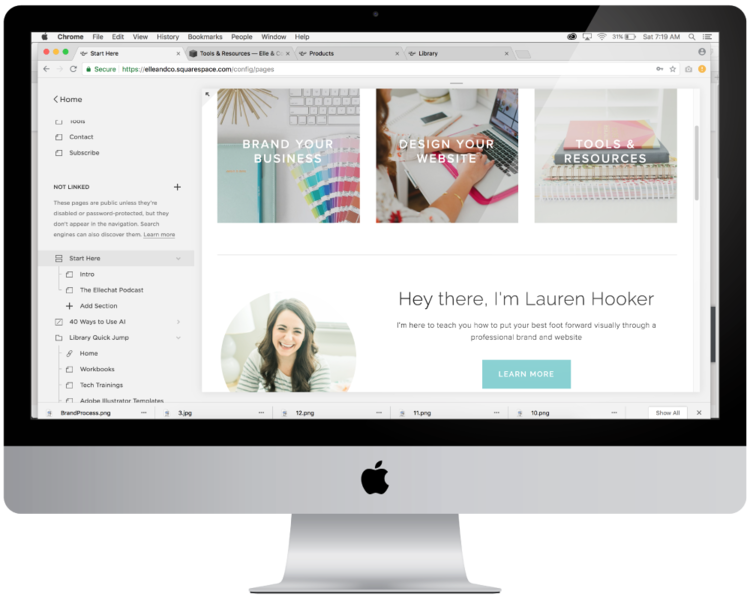 Unlike other email marketing platforms, ConvertKit was designed specifically for online business owners, which means tasks like automating content upgrades and mapping out sales sequences are a breeze to set up. Crowdcast is the only livestream tool that accomplishes all of the above and more. While it’s a chore in and of itself to create branded business cards, packaging materials, and stationery for your business, it’s even more difficult to find an easy, affordable printing company. Some companies are too pricey. Some are difficult to work with. And some might be affordable, but their print quality isn’t quite up to par. Moo, on the other hand, is a high-quality, one-stop-shop for all of your business printing needs. Their wide selection of products, useful templates, and easy-to-use website make uploading and bringing your designs to life a breeze! Your website’s functionality has a lot to do with the platform you use to set it up. There are several platforms out there to choose from - Wordpress, Blogger, Wix - but the platform I use for Elle & Company and recommend to all of my clients and customers is hands-down, without-a-doubt, Squarespace. One of the scariest parts of starting and scaling a creative business is setting it up legally. Not only are contracts, privacy policies, and terms and agreements totally outside of your wheelhouses, but the consequences of not setting them up correctly can be detrimental to your business. Thankfully, the Contract Shop has you covered, and their legal templates and courses are specifically designed for creative entrepreneurs, online course creators, consultants, coaches and more.